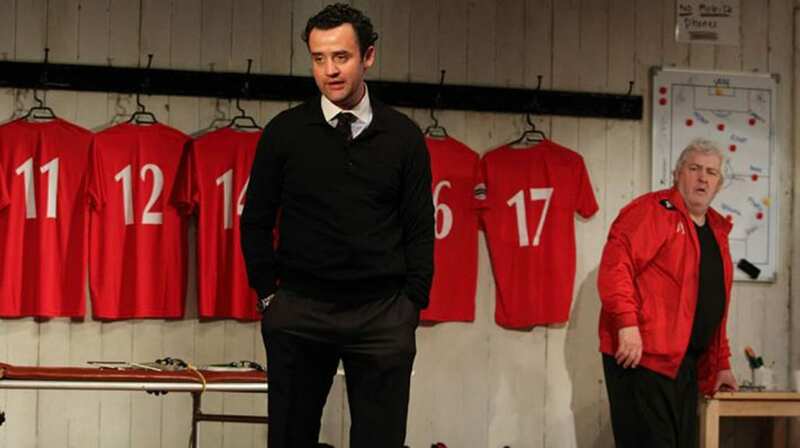 This new play by Patrick Marber is about many things: football, morality, ritual. Above all, however, the play poses the question, what does it mean to be a man, a mensch, a legend? The true brilliance of The Red Lion is that Marber manages to raise the drama from the plain of dressing room saga to that of epic tragedy. ‘The game’, as John Yates, the legendary kitman of a fictional non-league football club, revealingly declares ‘is ritual’. It is in this club’s mythical and elemental changing room that the entire action of the play unfolds in three memorable scenes. This triadic structure is mirrored by the characters’ ages, as the drama focuses on the interrelations between middle-aged manager, Kidd, the young hopeful, Jordan, and the old-timer Yates. The sympathetic kitman, who is referred to as ‘the ledge’, loves the ritual of filling out the team sheet; in fact, he seems to love the club, its history, and the game more than anyone. Marber’s delight in language is clear, a playwright who loves ‘the game’, the chance ‘to play’. Jordan, the promising young footballer, is described as ‘different class’, a footballing cliché that Marber’s smart writing elevates and complicates. Jordan is of a different class in terms of his footballing talent, a different class of person to most of the audience, and, at least potentially, a different class of human being to the rest of the flawed characters on the stage. The kid, after all, ‘can play’. This verb, ‘to play’, which can of course be applied to the stage and to the football pitch, is the operative pun of the drama. Indeed, the parallels between theatre and football are intelligently explored by Marber, who, perhaps unexpectedly, equates the two. Calvin Demba, who plays Jordan, can certainly ‘play’ too. 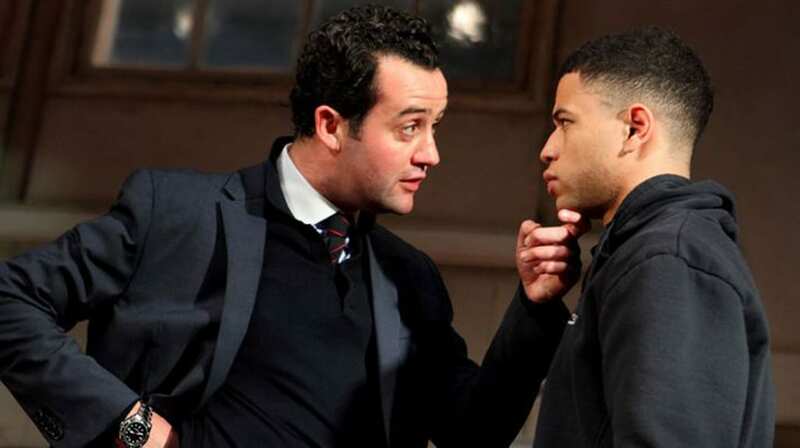 In fact, the cast of three, Calvin Demba, Peter Wright, and Daniel Mays are all equally excellent. As Marber himself acknowledged in a pre-show discussion, the actors truly bring the play to life. This becomes particularly apparent in Wright’s agonising, carefully choreographed descents to his knees in order to sweep up the mud, Demba’s carefully judged shifts from pious believer to angry adolescent, and Mays’s accurate and comic portrayal of a conniving and desperate non-league manager. Director Ian Rickson and designer Anthony Ward remarkably succeed in elevating the non-league setting to a mythic level. Marber’s King Lear references are subtle but effective – Kidd ‘howl[s]’ when he loses; he is a man who must win: the act which ‘brings us to rest’. Marber’s new play is more than just a great play about football, as he goes further to explain why the game matters, demonstrating that it is an important and worthy subject to dramatize. Through allusions to Shakespeare and the Bible, the play combines high and low drama, transcending our generic expectations and moving beyond the realms of naturalism. As the audience may anticipate, football offers monetary reward, enjoyment, and camaraderie, but more interestingly, it gives the characters an opportunity to attain redemption, grace, and peace. This masterful combination of football and theatre offers up something bigger and more meaningful. With mysterious profundity Kidd admits that ‘heart and intelligence’ are the qualities that make a real footballer. It is of no coincidence that these are the very same qualities that make an outstanding playwright. Patrick has just completed a degree in English Literature and Language at University College London. 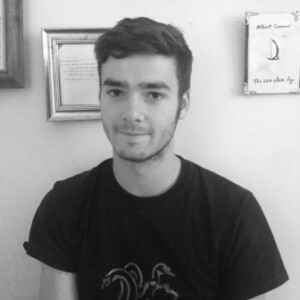 He is predominantly interested in the dramatic works of Samuel Beckett but also likes walking and parks. He enjoys fishing, woodcarving, carpentry, and various delicious snacks.